1.Foul Line: The ball position calculated back to where the ball crossed the foul line. 2.Arrows: Ball position at 15 feet. For most people this is where the person is targeting. It is good to be able to consistently hit different targets all the way from 1 to 25. 3.Breakpoint Board: Ball position at the furthest point away from the center of the lane. The desired position varies depending upon the lane condition, bowling ball and the bowler’s dynamics (speed and revs). 4.Breakpoint Distance: The distance the ball was at the breakpoint. Much like the breakpoint board this will vary largely based on the variables of condition, ball and player. 5.Entry Board: The ball position at 59.5 feet. The strikes percentage is highest when hitting the pocket between 16.5 and 17.5 but varies depending on the speed and angle of the bowling ball. 6.Launch Angle: The direction the ball is going in the front part of the lane. Zero would be the ball going straight down the lane, a negative number means it is going towards the gutter, a positive number towards the headpin. The number should be relative to how you play the lanes, the more you play outside the lower the number will be, the more inside you play the higher negative number you will see. 7.Impact Angle: The angle of the ball between 57 and 59.5 feet. 8.Launch Speed: The speed the ball is in the front part of the lane. Most professionals range between 17.5 and 21 mph with a range of less than .5 mph. It is also important that you can vary this speed to help match up to different lane conditions. 9.Entry Speed: The speed the ball is going when it hits the pins. The ball will lose between 3 and 4 MPH when traveling down the lane. 10.RPM: Rotations Per Minute: A calculated number that calculates the revs of the player based on a number of factors. Environmental factors can change the number dramatically so it should only be used as a reference point during normal conditions. You can pause the recording by tapping pause – and start recording again. You can save your shots by tapping the red button again. You can rename your session before you save by tapping on the pen icon at the popup. 3. Evaluations: Create and save ranking sessions and ball performance tests. understand what parts of your game to work on. select the desired practice and follow the steps. 3D view is a more visually appealing view that shows you similar information as the live view. 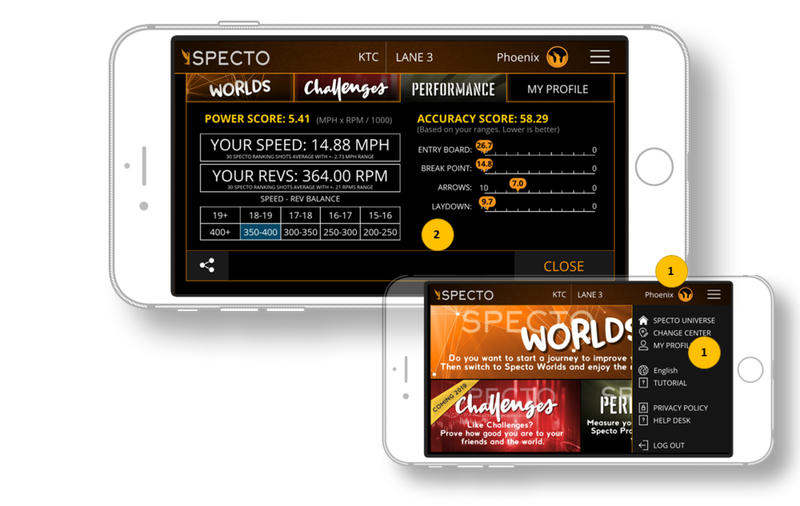 1.Launch Data – Ball speed, position, and revs in the front part of the lane. 2.Launch Speed – Ball speed data for the front part of the lane. 3.Hook Data – Information showing where the hook phase starts. Ball speed, position, and distance at the start of the hook phase (or end of skid phase). 4.Roll Data – Information showing where the roll phase starts. Ball speed, position, and distance at the start of the roll phase (or end of hook phase). 5.Entry Speed – Ball speed data at the pins. Ranking sessions will update your level ranking after 30 shots. Helps you understand your strengths and weaknesses and know what part of your game to focus on next. 2.Select a ranking type – each ranking is the same, the only variation is the total number of shots. 4.Live View – click here to return to live view. 5.My Sessions – Manage any of your previous sessions. You can view, delete, or add notes for any session. 6.Practices – click here to go to practice sessions. 2.Live View – click here to return to live view. 3.My Sessions – manage any of you previous sessions. You can view, delete, or add notes for any session. 4.Evaluations – click here to go to a ranking evaluation session. 1.Tapping on your name or MY PROFILE from the hamburger menu enables you to reach your statistics. You need to complete at least one evaluation. 2.In the PERFORMANCE statistics screen you can check your Power Score, Accuracy Score and lots of details about your shots.